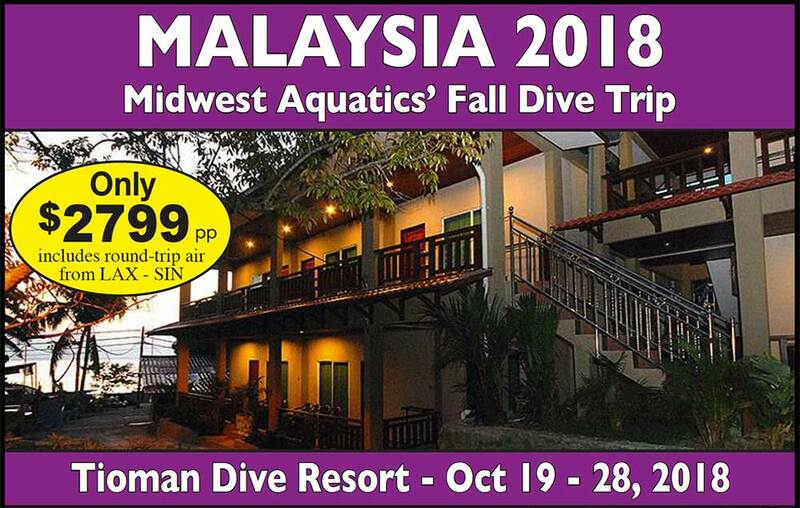 Midwest Aquatics is headed to Tioman Island! A truly fascinating holiday destination. Tioman is best known for it’s diving activities. Visit some of the best dive sites you can find in the South China Sea. They have something for everybody, if you’re just learning to dive or if you’re already a seasoned diver seeking new adventures. Tioman Dive Resort was built in 2012 and extended in 2014 and is regularly maintained. They are a small, cozy resort with just 11 secluded rooms available to diver and non-divers alike. Tioman Dive Resort is conveniently located just meters from the scuba diving centre in ABC (Ayer Batang Bay) on Tioman Island. Tranquil places, an astonishing island, a little nightlife and beautiful coral reefs, that’s what Tioman is all about! Experience an amazing dive destination at affordable prices. Their professional staff guarantee safe and unforgettable diving experiences for all. Day trip to Varella Rock/Gyoshin Maru trip. Airfare from KC – LAX, gratuities, Nitrox, equipment rentals and dinners. All payments are non-refundable and dependent on being able to fill your space. We highly recommend Dive Accident Insurance as well as Trip Cancellation Insurance. The Dive Assure Diamond Policy includes both Trip Cancellation Insurance & Diving Accident Insurance and can be purchased by going to our website and clicking on the link to Dive Assure or you can purchase it at Midwest Aquatics Swim & Scuba Center.